Garage Door Springs | Chicagoland Home Inspectors Inc. 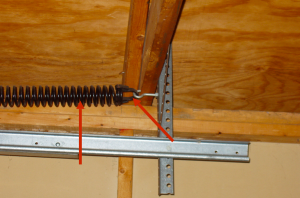 There are two types of garage door springs. Expansion (extension) and torsion. All springs are under tremendous pressure and are considered dangerous. Only professionals should work on these springs. 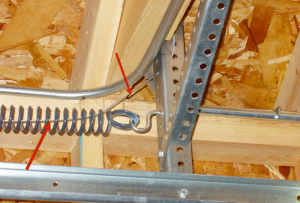 First I will talk about the torsion springs and how we inspect them. Torsion springs come in many different sizes. They twist to help support the door to make it easier to open and close. Each one is designed to support certain weights and sizes of overhead garage doors. The first thing we have to do is determine if the springs are the correct size for the door they are helping to lift. If the springs are professionally installed, the installer will spray paint a line straight across the springs. The springs are supposed to be wound 7.5 times. So we should see 7.5 spaces between the lines if the springs are properly wound. 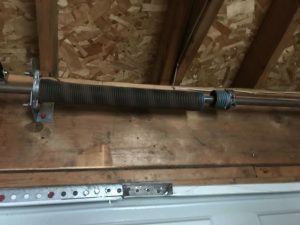 Then we disconnect the door from the garage door opener. We move the door so that the bottom of the door is close the the middle of the opening. The door should stay in the middle, fully open, and the fully closed position. If the door falls or springs up, there is a problem. They are also color coded at the ends. The codes are as follows. The most important thing to check when inspecting these doors is that a safety cable is installed. These springs break. When they break, they are violent. 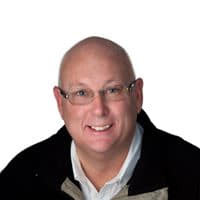 The cable secured at both ends will keep the spring from damaging property or harming people and animals should they be near when it does break. We will also check that both springs are the same on both sides. This includes length and color coding. And when we open the door; it should open equally on both sides.